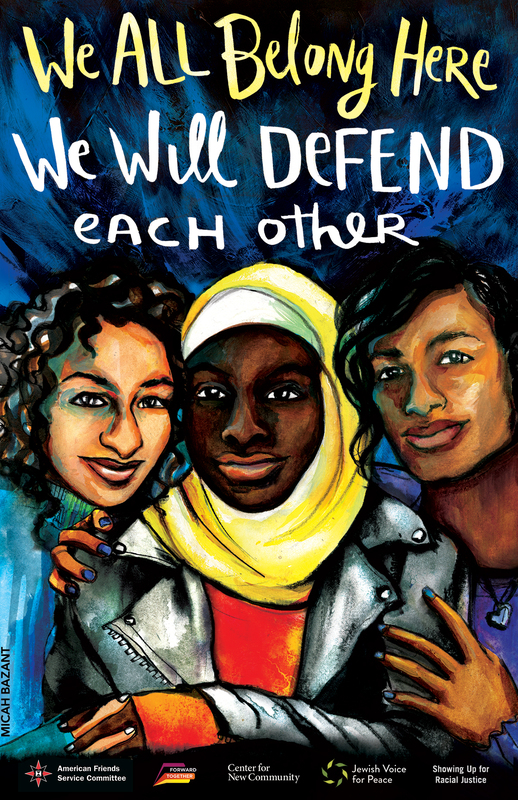 Share and display the artwork below in your community to create welcoming spaces for all. Driven by a desire to provide tools for schools and the larger community to create space for discussion and declare solidarity, artists Micah Bazant (of the JVP Artists and Cultural Workers Council) and Kate DeCiccio partnered with American Friends Service Committee, Forward Together, Jewish Voice for Peace, Center for New Community, and Showing Up for Racial Justice to produce these beautiful images. Download the free 11″x17″ poster or view the digital graphic. Use these images with this new short anti-violence video or incorporate it with toolkits and materials prepared by groups across the country. To order prints, visit Kate Deciccio or Micah Bazant. You can find the recording of this bystander intervention training here and the powerpoint is available here. Racist, transphobic, homophobic, misogynistic, antisemitic, ableist, and Islamophobic attacks are on the rise. Our organizing must include real clarity and fresh tools to help us show up for each other–even, or especially, if we’re strangers. 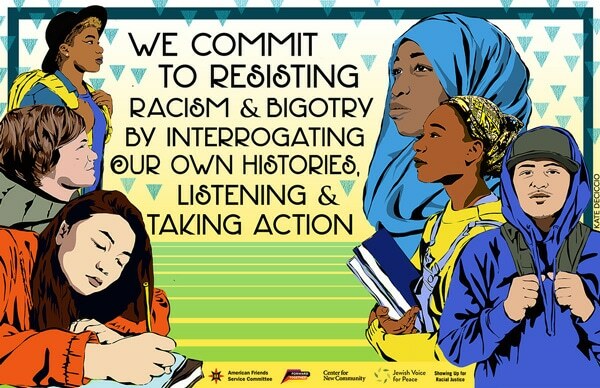 Drawing on lessons from transformative justice work, anti-violence organizing, and bystander intervention approaches, we’ll ready ourselves to interrupt bigotry, harassment, and violence in our day-to-day lives.